ODEM, creator of the world’s first On-Demand Education Marketplace, took its vision of blockchain technology and education to the headquarters of the European Commission earlier this month. ODEM CEO Richard Maagul, Chief Technology Mentor Dr. Adel ElMessiry and Chief Academic Strategist Larry Bridgesmith spoke July 2 to more than 100 people including representatives of European member states at the Commission’s CONNECT University Summer School 2018. 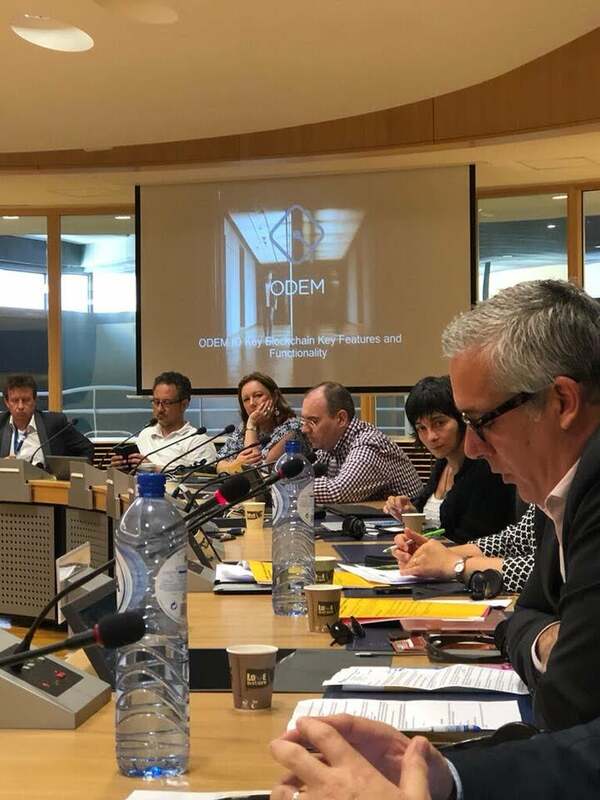 ODEM leaders were invited in the context of Blockchain in Education, a report by the EC’s Joint Research Centre published last year. In the study, JRC Director Andreia Inamorato dos Santos, Ph.D. and her colleagues defined the challenges and opportunities of blockchain technology as a tool for innovation of education. From formal education to skills training, the report focused on blockchain’s potential to transform the sector. The JRC’s vision for blockchain and education innovation parallels work being spearheaded by ODEM. The JRC identified eight use cases for which blockchain technologies could reshape education delivery, certification and credential retention. ODEM’s use cases are virtually identical, not counting three more that were of interest to the EC. Those common themes explain why ODEM’s Rich Maaghul addressed the gathering the immediately following Dr. Inamorato dos Santos’ presentation on the future of blockchain-enabled education in Europe. A shared vision became eminently clear. ODEM leaders touched on some of the opportunities for blockchain technology to make a difference in education. ODEM is committed to providing students with a marketplace to acquire the training they need in fast-changing industries. In addition to streamlining the process of organizing high-quality, in person training, ODEM is positioning to become a major force in the compilation and secure storage of personal, academic and professional credentials on the blockchain. ODEM will also deploy blockchain technology to assist dispossessed migrants and refugees to reestablish their professional and educational identities. ODEM is already involved with the Internet Bar Organization in aid of Rohingya refugees in Bangladesh. Discussions at the conference included the potential for private/public partnerships. The European Commission plans to invest more than €700 million ($823 million) in digital skills development between 2021 and 2027, part of the planned €9.2 billion Digital Europe program that was announced on June 6. ODEM leaders came away from the gathering invigorated by new professional relationships and friendships in Europe. They applauded the EC’s commitment to stimulating innovation in blockchain technology and the education sector in much the same way that ODEM is shaping the future of learning through its rapidly developing ODEM Platform.